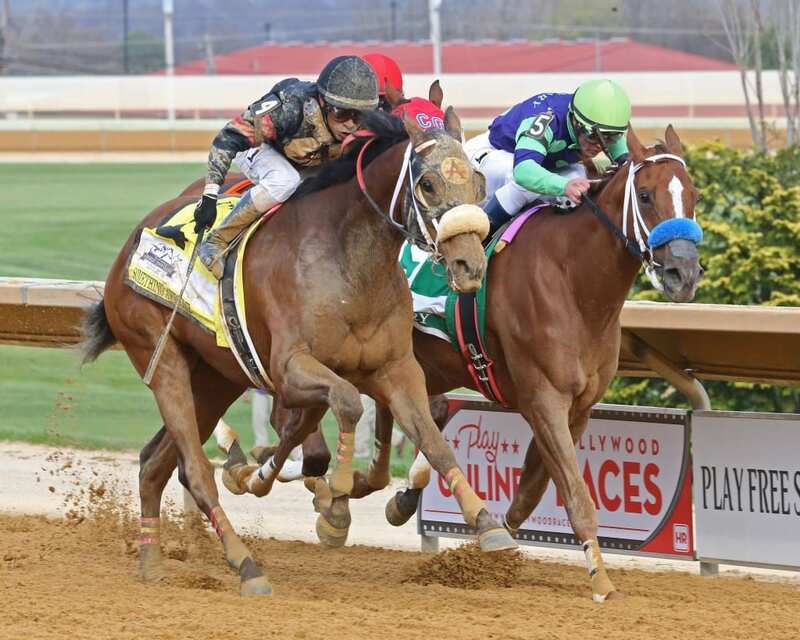 Something Awesome won the Grade 2 Charles Town Classic. Photo by Coady Photography. Trainer Jeff Runco has been on a roll since the beginning of March, and he’s picked up seven victories since our last Charles Town trainer rankings to pad his overall lead. In our previous check-in, Runco had made some noise by leaping from second in our point standing to first, and it is a position that he has not given up since. In fact, Runco now has 310.92 points, 22 more than any other trainer. His winning streak has also left him on top in terms of wins, with 41 visits to the winner’s circle overall, and second in terms of win percentage, with a strike rate of 24.26 percent, and third in earnings per start ($3,888). We did make one adjustment to the rankings this week. The purse of the Charles Town Classic is so much larger than other purses at the track, and this year’s winning trainer, Jose Corrales, qualifies for our rankings with 29 starts. That left him with an earnings per start figure of more than $25,000 – about six times any other trainer. In order to avoid having one category loom so large, we set Corrales’ earnings per start ranking number to 100 – the maximum – and the next highest to 80, with other trainers’ numbers then based on how they compared to the runner-up. In brief, the rating system rewards those who win often and in the biggest races. We applied the stats to every trainer at Charles Town who’s made at least 28 starts and won at least one race. Just like in our previous ranking, the next three trainers are James Casey, Joan Reynolds, and Ollie Figgins III, in second, third, and fourth, with 288.30, 285.67, and 249.04 points, respectively. One change that has taken place in our standings is Tim Grams rising from eighth place to fifth. The two trips to the winner’s circle that Grams has recently taken with Mrhuntssilver and Runnin’toluvya have contributed to his entry into the top five. Ronney Brown has only added one win to his name since our last ranking, but continues to hold his place in second in the win colony with 25 victories under his belt, though he has dropped to ninth in our rankings with 221.11 points. Nine wins behind him in third sit Figgins and Grams, who are tied with 16 wins each. Casey and John McKee equal each other in a tie for fifth, with fifteen wins apiece. Joan Reynolds has not wavered from her leading position in the win percentage category. With a strike rate of 30.30 percent, Reynolds is comfortably ahead of Runco, who wins 24.26 percent of the time. John Carlisle sits in third with 23.26 percent, followed by Grams, who holds a win rate of 23.19 percent. The top five is completed by Figgins, who has a win percentage of 21.62 percent. As mentioned earlier, the tenth running of the $1.2 million, Grade 2 Charles Town Classic April 21 threw a wrench in the track’s earnings-per-start ratings. Something Aweseom, a bay gelding, stormed to victory in the event, causing trainer Jose Corrales’ earnings per start to skyrocket – from just $1,773 in our last ranking, to a staggering $25,087 earnings per start. Far behind him in second sits Casey, the previous leader. His earnings per start of $4,226 keep him safely ahead of Runco, whose earnings per start come to $3,888. Figgins and Contreras complete the top five, with earnings per start of $3,566 and $3,402, respectively. Having failed to saddle a horse since April 13, William Aylor Jr. drops out of our rankings, giving the top position back to Kristy Gazzier when it comes to the highest wagering return on investment. Gazzier has been kind to her backers, rewarding them with an average of $3.50 for every $2 bet on her horses. Reynolds slides into second with an ROI of $3.04, leaving Casey, who was previously second, third with an ROI of $3.00. Corrales comes in at number four, with an ROI of $2.24, and is followed in fifth by John Casey, who holds an ROI of $2.22. The report covers racing action through May 1, 2018. Nicely done Chelsea! Keep it up!